Kindness. Image from Feb. 19, 2007 article in The Age. Illustration by Michael Leunig. “Put away from you all bitterness and wrath and anger and wrangling and slander, together with all malice, and be kind to one another, tenderhearted, forgiving one another, as God in Christ has forgiven you.” Ephesians 4:31-32, NRSVCE. We generally equate niceties with kindness. As common pleasantries are the easiest, most readily observed manifestations of kindness, it’s easy to think of niceness and kindness as synonymous, if not one and the same. I offer that niceness and kindness (and civility, for that matter) are not one and the same. They have some areas in common, sure. These are aspects that overlap, but don’t indicate sameness. Reading up on the differences between niceness, kindness, and civility, a pattern focused on intentions emerges. The problem I have with this is that people don’t really wear their intentions like a visible sign on their heads (or anywhere else that we can examine, touch, and point at). Especially during brief, nano-seconds encounters, we won’t catch a glimpse of the other person’s intent. How then can I know if they are just “being nice” vs. “being kind”? A friend whom I greatly admire and love is one such person I think of when as the embodiment of kindness and niceness. However, you’re only lucky to catch a glimpse of such qualities after you have gotten to know her better. To unknown elements she is the embodiment of civility. She is still pleasant, a bit detached, but polite and respectful. Once you get to know her a bit more, and she gets to know you, she is both kind and nice. Which brings me to the commonly held stereotype of kindness and niceness–that such a pleasant, compassionate demeanor is equivalent to weakness. Taking my friend again as an example–I would not call her weak. Her approachable persona, her helpfulness and cooperativeness, and her slightly irreverent and biting sense of humor and wit seemingly belie her strength of character and will. She’s fun to be around and a great, wonderful person to have your back when the going gets tough, but she is equally principled, determined, and has a high standard of work and behavior. She inspires me to be a better person. Ultimately, the ability to inspire others to be their better selves through positive means is, I think, the essence of kindness. To be able to do this, however, involves the ability and willingness to listen to and put another person and their concerns ahead of one’s own. Niceness is the behavioral manifestation of kindness. I think this is why we often equate both. They are linked, but not the same. A person can be nice without being kind. Conversely, a person can be kind without being nice, at least not all the time. Sometimes we justify tough-love actions as kindness. I hear “you have to be cruel to be kind” quite a bit. I don’t buy it. Sure, there are times when a person needs to deliver some unpleasantness for the sake of a larger goal. As a parent, this is something I know very intimately. 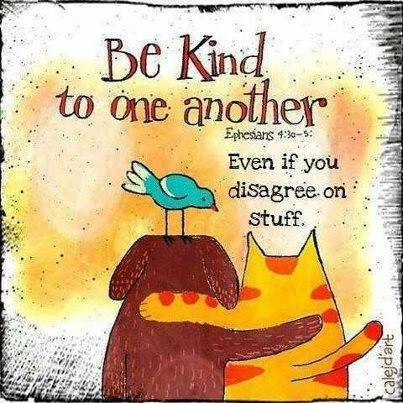 However, being kind also means acknowledging the effects of the unpleasantness one needs to deliver. I don’t mean putting on a sad face and body language, either. There are consequences for not being nice that affect others to such an extent that the course of their lives are altered. Being truly kind doesn’t mean one shouldn’t deliver unpleasant news at all. It means understanding that how one personally feels is a distant second to how the other person feels. What does this, kindness vs. niceness, have to do with advocacy? I see kindness and compassion as foundational values of advocacy. In advocating for information literacy, community, diversity, inclusion, education, and privacy, I see kindness as an underlying ethic that states “people first.” Civility, in my estimation, is the baseline of decorous dialogue we need to live and act in a multicultural, multiethnic democratic society. We need to be able to talk to each other, find ways to demonstrate and connect to each other in ways that demonstrate our feelings and value for human kindness. As far as I am concerned, to be kind is to be human…and to recognize others as human, too.